Anniversary albums can be interesting beasts. Some bands put together compilations for major anniversaries, some re-issue old material, some bands go in different directions. Others – like DESTRUCTION – seek to support their past output, whilst demonstrating why they are one of those bands at the forefront of their genre. If you know Destruction at all, you know them as a take-no-prisoners, fast-foward, straight-up, brutal thrashing beast. They go hard, all the time. Live or recorded, you can’t go past Destruction if you need a thrash fix. So with this in mind, you’ll be happy to know that you won’t be disappointed by Spiritual Genocide. BUT you may well be pleasantly surprisedat the album’s atmosphere and groove. Because you know what, even though Destruction can flay you with one riff – especially live! – Spiritual Genocide is the band’s way of reinforcing the fact that we shouldn’t pigeonhole them. Yeah it’s still thrash, but it pushes the Destruction boundaries a little more. Thirty years in, this album is the kind of thing that you expect from one of the world’s most impressive thrash bands. It’s well crafted, well written, well structured, sounds as good as an MP3 promo is going to sound, and rides you from start to finish. I’d love to hear it on vinyl, actually, to get a real sense of what it’s like. There are also a few guests on this album who came to the party to help Destruction celebrate their 30 years: not only Tom Angelripper (SODOM), and Gerre (TANKARD), but also Ol Drake (EVILE), whom Destruction consider one of the best young thrash guitarists at the moment. While this album is great, I don’t know if it actually does surpass 2011’s Day of Reckoning, per the rantings of press and others. That will take a ton more listens to ascertain. Regardless, it’s still a killer album, and if you’re a Destruction fan, you can’t not add this one to your collection. 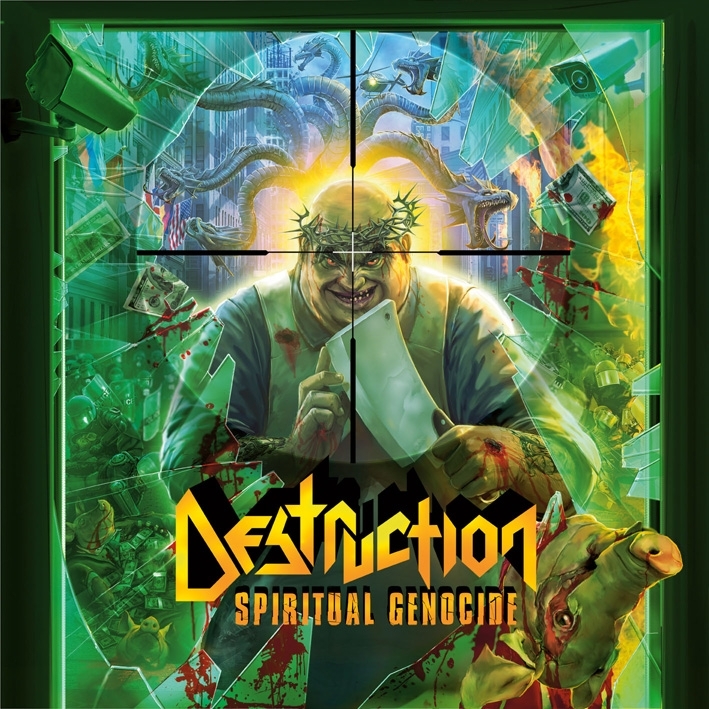 DESTRUCTION’s 30 year anniversary album, Spiritual Genocide, is out now on Nuclear Blast.